In honor of Batman 5 Superman coming out this month (which, if Man of Steel is any indication, will be awful), I’ve decided to share my favorite Batman and Superman comics with you. This list will cover my favorite Superman comics, with my favorite Batman comics coming in another post. This is one of my favorite comics ever. It’s a comic anyone can pick up with no knowledge of Superman at all. It’s technically not even about Superman, but rather some guy named Clark Kent living in a world where Superman comics exist, and he’s often mocked for his name. The twist is, he actually has super-powers. This is not a superhero story, however. There’s no villain. It’s simply a story about life and growing up. The story starts with young Clark still in high school, and goes through romance, marriage kids, and eventually grandkids Its a beautiful, touching story. 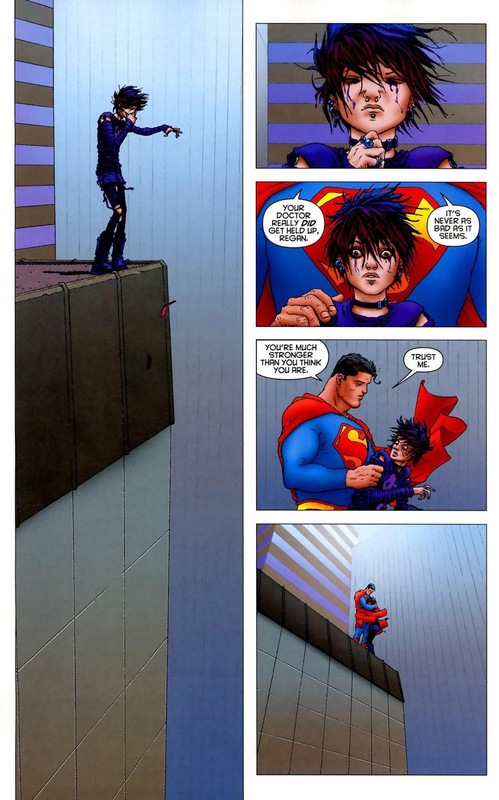 If you’ll only read one Superman comic book, this should be it. An Elseworlds tale, asking what if Superman had landed in Soviet Russia instead of Kansas. It’s a fun story with an amazingly clever ending. Its interesting to see Superman as the villain, plus Russian Batman is totally awesome. Oh, and commie Superman is STILL a better Superman than Man of Steel’s. My favorite re-telling of the origin of Superman. This is everything Man of Steel should have been. Instead we got a murderous Superman who didn’t care about saving lives, ruined someone’s livelihood for insulting him, and likes to make out with women he just met when human ash is raining down all around him. Idiots. This comic by Grant Morrison is about Superman’s end. It’s something of a possible ending to the pre-Crisis Superman comics (the more outlandish Superman comics that came out pre-1985). It’s a touching story about Superman being tricked by Lex Luthor and succumbing to what’s basically some sort of ‘super-cancer’ and follows the last few months of Superman’s life, and how he lives knowing his end is near. An animated movie of the same name exists as well. It it’s good, but not as good as the comic. These were some of the first comics I read, and its responsible for getting me into comics. While continuity heavy, it’s definitely worth a read. It’s about the time Superman died (as opposed to the time he made us all feel dead inside *coughmanofsteelcough*). An animated version of this movie exists as well, titled Superman: Doomsday. It isn’t as good, but still watchable. About halfway through it goes off in a totally different direction. A fun couple of stories where Batman and Superman team up, one of which is also the origin of Supergirl. It’s really enjoyable because of the contrast in the two characters personalities. (How they’ll pull off a cross-over in Batman 5 Superman, with both of them being brooding, dark, angst-machines and still make it compelling, I don’t know.) Both Public Enemies and Supergirl have been turned into animated movies, titles Superman/Batman: Public Enemies, and Superman/Batman: Apocalypse. Public Enemies is actually slightly better than the comic it’s adapted from, but Apocalypse pales in comparison. This is far from a completed list, but it’s enough for now. Do you have any favorite Superman comics? I’m going to see it out of a sense of duty (you can’t call yourself a comic book fan and not see the first live action team up of Batman, Superman, and Wonder Woman. I’m not looking forward to it though. Snyder has proven time and time again that he just doesn’t get Superman. Yeah, same here. The Marvel movies are more my speed, honestly.